A little social challenge in todays post. A plea to sign a petition to help a young family and a gofundme page to help them with their plight. We have 32 supporters as of writing this blog. It often takes a few days to build momentum. "Kim Moran has been stuck in Africa for the past three months waiting for Ottawa to process documents and is now pleading for help. She said the adoption is complete but that the government is failing in its responsibility to bring them home. Diagnosed with multiple sclerosis, Kim requires a special diet and medication. Her mother said the ordeal has been hard on her health. “It needs to be monitored every month,” Cindy Jeans said from her home in Port Hope, Ont. Trudeau simply needs to make the call!! Perhaps Ghana's Honorary Consul General in BC can be of assistance in moving this forward as well, Mr. George Addei-Piprah. We have 10 days before Christmas Day to get this done. 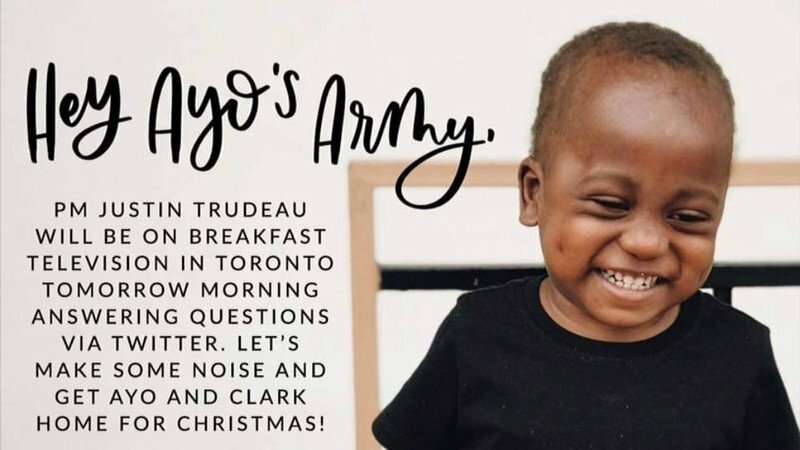 Let’s get Ayo and Clark home with Kim. Let’s unite this family ! Well thank you ! With over 20,000 signatures on our petition we have brought a great awareness of the Moran family’s plight. Unfortunately, we still are pleading with our Canadian Prime Minister Justin Trudeau to make the call. Change.org is proudly funded by people like you, Tim. As a public benefit company, we rely on the generosity of ordinary people — rather than government funding or annoying ads. Each contribution we receive means our small team can help petition starters win their campaigns. We believe in the voice of the people — that’s why we built a platform that is a 100% independent and available for everyone to create the change they want to see. Become a Change.org Member today! The person (or organization) who started this petition is not affiliated with Change.org. Change.org did not create this petition and is not responsible for the petition content.Click here to stop receiving updates about this petition. We’d love to hear from you! Contact us through our help centre. Powerful personal in person appeals have been ignored. Our Minister of Immigration, Refugees and Citizenship Ahmed Hussen is ignoring the pleas. Her Excellency Ms Heather Cameron, our countries High Commissioner in Accra Ghana, who Tim has personally discussed the matter with, and is well aware of the matter, advises she does not have the power to grant a visa. Many might not be surprised that the government actually changed their immigration website a few days after the story originally broke to keep the government talking points straight. So much energy, and money being wasted by our representatives for this matter and such a simple request. Frankly, our Canadian government has simply failed this family. Yet, we still need to keep asking, bring our people home, #BringAyoHome . So, this morning ( Friday Dec 14th 10 days before Christmas ) we are asking once again to #BringAyoHome so he and his family can be reunited for Christmas. Justin Trudeau will be on BT TV in Toronto answering questions by Twitter. So please turn on your twitter feeds and start asking some questions. Include @JustinTrudeau @HCameronGH and @ahmedhussen this will get to their precious social media platforms. It’s hard to believe sometimes that this is life as we know it at present. But we do believe in miracles, we’ve seen and been fortunate to witness and hear of too many to question. And each of those stories build faith for moments such as this ... we’re still hopeful, that we’ll all be home for Christmas! Thank you Heather for taking the time to review my profile on LinkedIn yesterday. I have been trying to reach you the last few weeks. I am not sure if you are receiving my emails, or hearing about the requests from the family or others across Canada. There is a matter of great urgency that I respectfully request your assistance on. I normally do not reach out in such a direct way, however this matter is of extreme importance and one that only you can take care of. I am attaching a summary provided by the Moran Family regarding their request for a Citizenship Facilitation Visa for their adopted son Ayo. I do hope you can expedite this matter, as it would be wonderful to have the family united once again and this time in Canada. If you require any additional information please connect with me directly. My contact information and direct cell phone is in the signature below. I can also provide any authorization you might require from the associated parties for privacy purposes if you desire. I am hoping that we can be friends and that you will be that friend for the Moran's.